The fine white sand of Torrevieja beaches is one of the main attractions for tourists,as well as the calmness of the waters. 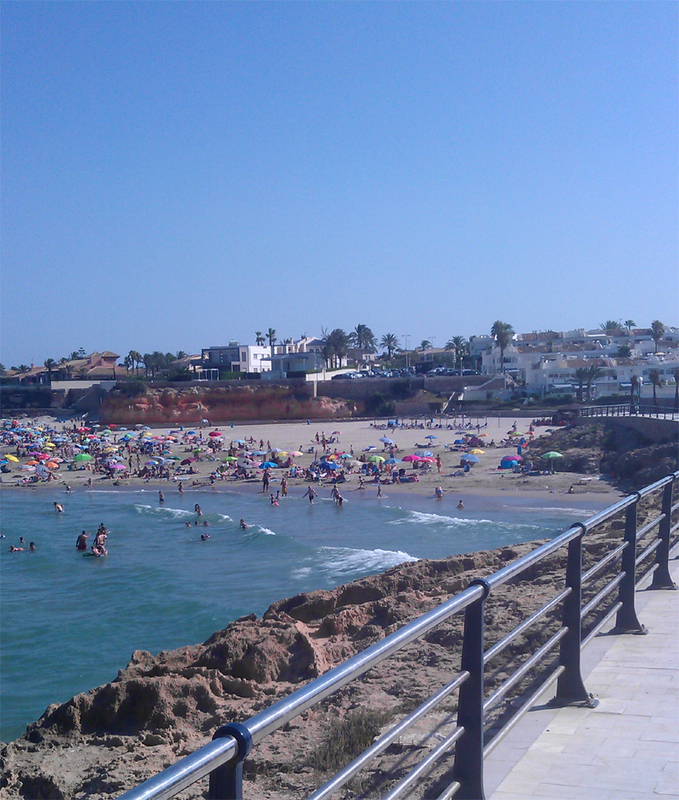 The beaches are maintained all year round, and that together with the mild weather in winter makes it usual to find groups of sunbathers on the Torrevieja beaches throughout the year. It is during the summer that you can find the best choice for leisure activities. A beautiful beach only 10 minutes walk from Amapolas II. 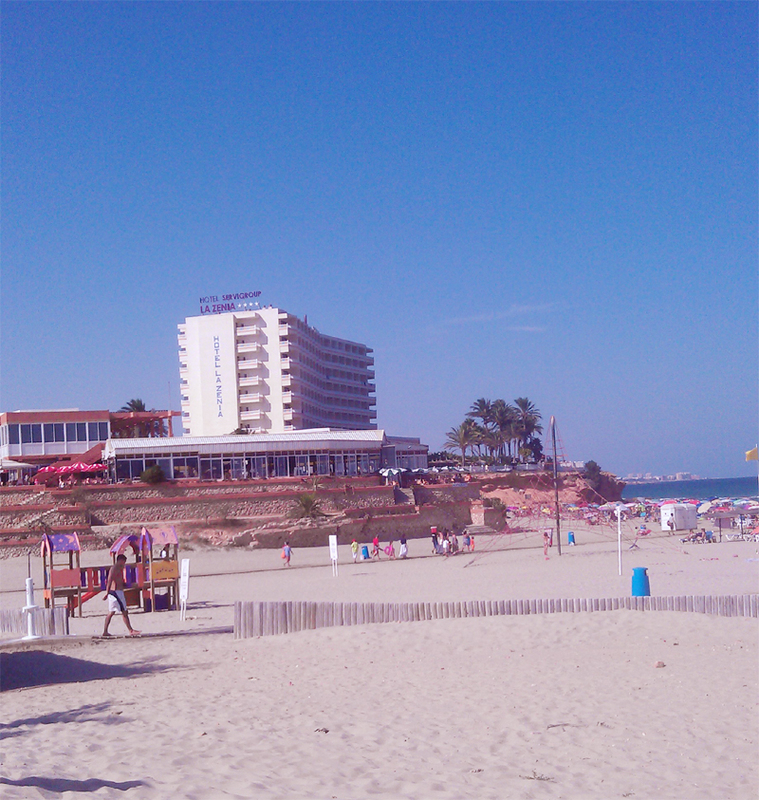 all the way to La Zenia beach. Spectacular walkway down to the beach and the Meditterranean. Beautiful compact beach with beach restaurant and bar. 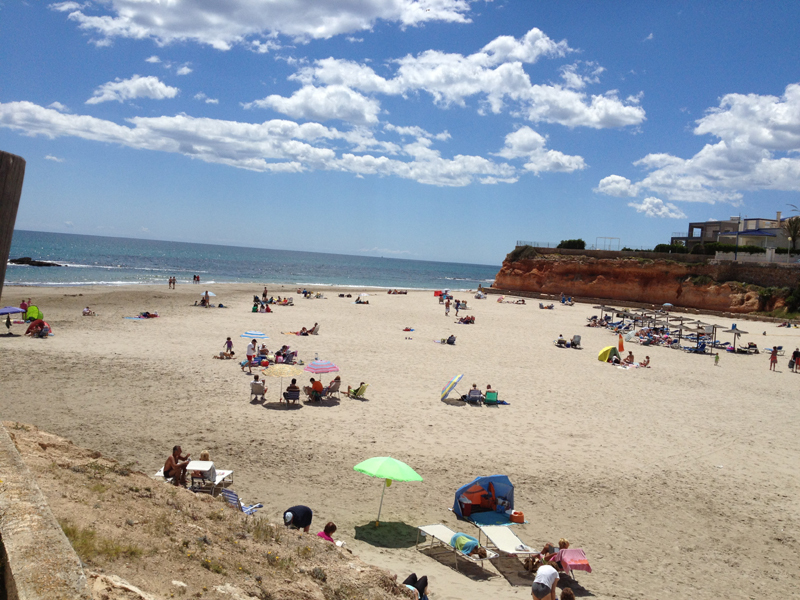 Crowded in Summer, especially August, like all good beaches in Spain. 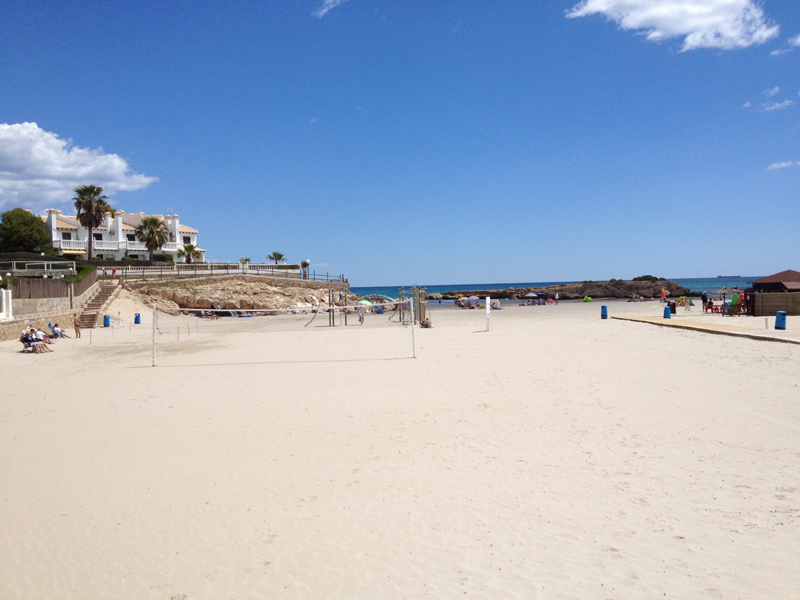 This is the closest beach to Amapolas II, and is about 10 – 15 minutes walk (depending on your pace). Just go down the hill towards Paddy’s Point Pub and turn right at the roundabout through the tunnels beneath the N332. Health Services: first aid services, two watchtowers, lifeboats. Summertime Facilities: ice cream stand, newstand and small bars. Water Facilities: Windsurf sailboats, and watercycles. They are Cala Peñas, Cala Mosca and Cala Estaca. you have Cala Mosca on your left and Cala Peñas is the next along northwards towards Punta Prima. Cala Estaca is round the headland on your right. This urban beach has footbridges and disabled access and is cleaned regularly. You can rent sunbeds, yachts and umbrellas. Length 400 m and average width 50m. It can be busy, especially in Summer. There is a beach boardwalk. 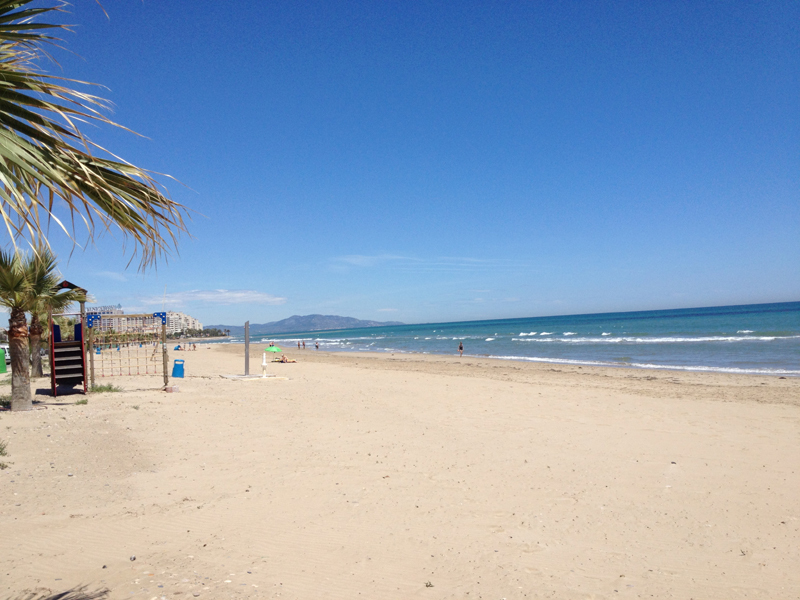 This is a very popular beach, as it is within the Torrevieja’s urban area. 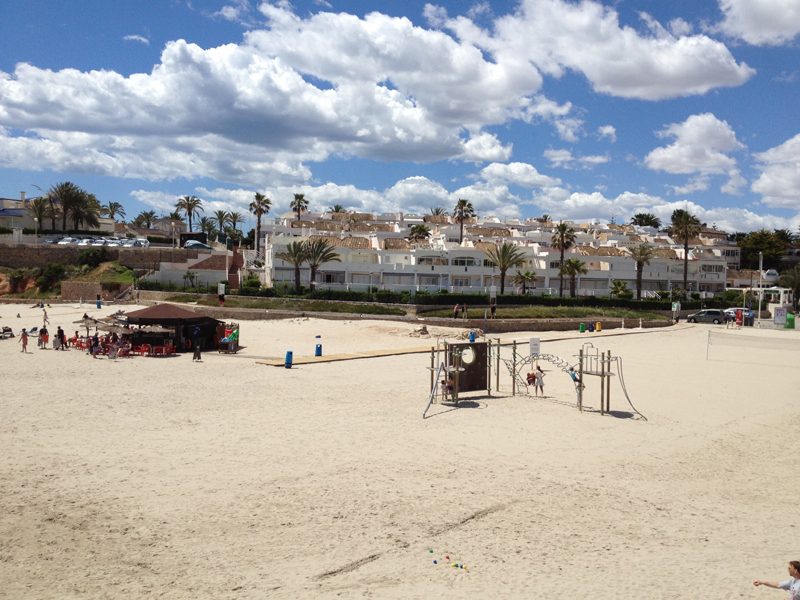 This beach is 325 metres long and about 28 metres wide, and is the nearest beach to the centre of the town. 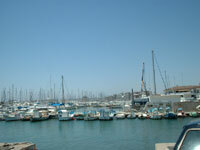 It has a nice and recently renovated seafront full of bars, souvenir shops, ice-cream parlours and restaurants. It has a tourist info centre, surveillance towers, and lifeguards right on the seafront. Long beautiful shores, ideal for sports competitions, especially in August. And nearby is the Cabo Cervera, a sandy beach equipped with showers. This cape is the point that divides the inland from the coast. There is an abundance of bays, with long and beautiful beaches. Health Services: First aid services, two watchtowers, lifeboats, two ambulances, dangerous areas indicated. Summertime Facilities: Ice-cream stand, newstand and small bars. Water Facilities: Windsurf sailboats, watercycles and water motorcycles. It owes its name to an old mental hospital which was located next to this beach. Los Locos Beach is a long beach with fine and golden sand and quiet waters. It is 760 metres long and 25 meters wide. It is situated at the north of the town, just after the Palangre cove and curve. It has surveillance towers, lifeguards on the seafront, a first aid station and many bars and restaurants.